Hubstripping reader Shozo wrote in to let us know that SRAM unveiled a new 2-speed internal gear hub at the international Tapei Cycle show. As stated in this article at the Bike Europe site, it will be available in the summer of 2011 and is the same size as a single speed hub. Auto shifting? Awesome. I wonder how that works. Any thoughts? Just as this is a revival of the Sachs Torpedo Duomatic from long ago, the automatic variant surely revives the old Sachs Automatic, and must use a very similar mechanism. I’m wondering since it is Shram, It might be up to motor bicycle duty ? Sign me up if it is. My guess is that it’s a simple centrifugal auto-shift. BTW the picture is of an iMotion3 with an aluminum shell, not a new 2-speed. 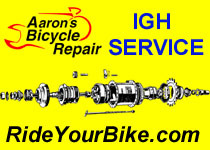 I think it is great that SRAM is doing more IGH hubs. Their i-Motion 9 was/is a great product. Too bad the guts are not serviceable (they use a one-time only crush washer to hold the guts together). IGH hubs are the future for city bikes. Now if only, parts were available! We had to import, thru a sister LBS in Germany to get i-9 parts. It should be easier! Apart from a few more details about the automatic 2 gear hub, named SRAM A2, the article mentions new 7 and 8 gear IGH from SRAM at the end of the year. You a Sturmey employee, John? John: Of course we care about the price, but SRAM has IMHO been able to put price-worthy hubs on the market before. What makes you say that the hub will “most likely be non-rebuildable”? The i-Motion 9 is near-non-rebuildable, and I am happy that the i-Motion 9 is going out of production, due to it’s non-servicability. But I take it that a 2 gear hub should be far less complicated than a 9-gear hub, automatic or not. And if you are not a fan of IGH’s – then why do you spend time on hubstripping.com 😀 ? The only hubs on the market that are truly rebuildable (at least in the USA) are Sturmey-Archer hubs. They have made a point to have info and parts available! Any bike shop can get parts for them from United Bicycle Supply in Ashland, Oregon. For years we sold and loved the SRAM Spectro 7 (formerly Sachs). They still make that hub, for now but we had to go to Germany for parts. Point is…. No modern IGH hub from SRAM or Shimano is “serviceable” because parts are just not available. Both companies just want you to replace the guts. Even Rohloff does not allow shops to take their hub appart because you cannot get parts, tools or instructions. But, like Rohloff, both the SRAM and Shimano hubs can be maintained by cleaning in Kerosene ane re-lubing. Shimano hubs can be stripped to a point, and the drive side of the i-Motion 9 can be replaced. It is frustrating that SRAM uses a one-time nut to hold the guts together. Removal destroys it. Sorry I ruffled some feathers here. Did not mean to sling any flames. I heard here they may be nonrebuildable ! I like the idea of IGHs. I like the outward appearance of being noncomplicated. Just have heard a lot of naysayers say they do their share of breaking. Have had two IGH 3 speeds break in my own experience. I can only draw on what has just been said. Please convince me otherwise. I would be more than happy to believe in IGHs. I would also like to know which IGHs are known to be plenty tough because I would like to experiment with putting light motor power to them. I like the idea of this automatic two speed. Sounds just the ticket for light motor power if it has any durability ? Thank you Aaron. That was informative. So, If I were to put 2 hp to a IGH you would reccomend Sturmy because they are repairable and parts are available ? Do their pawls still bend or break ? Or do you know of another tuff IGH ? I would go one of these Sram autos when they come out even if they were throw away if they were pretty tuff. 20 MPH is the federal speed limit for electric bicycles. It does not take 2 HP to get to that speed! I have done extensive testing with IGH and cargo bicycles. The sun gear fixing mechanism (usually a dog or pawl) can fail. This is particularily true with SRAM and Sturmey-Archer hubs. Shimano hubs seem to be a little more durable and Probably Rohloff, since they allow tandem use. The hub we have had success with is the NuVinci. No slippage. Schlumpf cranks are also OK with electric. Keep in mind that if you use gasoline power, no hub is rated for that. Ditto on heavy duty DIY electric motors. Anyone seens this hub in the wild (or know where to order this?)? That Sparta bike you’re pointing at is spec’d as kick-back shift, so I suppose it’s a Sturmey S2C at work inside the rear wheel! Seems to me it would be incredibly annoying to have a hub shifting gear whenever it felt like it, unless it was a continuous thing like a NuVinci. At risk of making this all read like a NuVinci ad, LOL. But as I was saying… you start bearing down a bit to go up a small hill, and you clench your teeth wondering when and if your hub is going to suddenly drop you into a lower gear? Is that how they work? I have not tried a NuVinci, but suspect for me (in a manual-shifted hub) it might be better to have distinct gears that I would tend to stick with until they became inappropriate enough to catch my attention. I fear I might constantly fiddle with tweaking the NuVinci’s ratio, to the point that it detracted from the enjoyment and safety of other aspects of the ride that deserve or require my attention. So I like hard, fixed gears OK. But to give them a mind of their own? No thank you. The auto-shifting hubs shift predicatably (at least the Sachs Automatic does).. I have a couple of the new SRAM A2s also .. they will be built up soon.. Does anyone know the dimensions on this hub? Does the coaster brake version have the same measurements as the non-coaster version? I’m wanting to build up a wheel and need to know so I can figure out spoke length. This hub is fabulous! I laced mine up to a mountain rim and am running it on an old Diamondback as my new winter bike. I have tried several 3-5 speed Sturmey hubs for winter biking and was never completely happy with them. The moment I jumped on this setup I was thrilled. It has the standard default shift point, about 10 mph on my rig I think. The overdrive is just enough to let me scoot along at about 16-17 with a 100-110 cadence. I have low gearing because there are a few hills on my commute in Wisconsin and I sometimes ride thru 2-4+ inches of snow.so I need low gear (34×22). I love the simplicity and clean look. The coaster brake works surprisingly well and I have only had a couple instances where the auto-shifting was not ideal. But a vast majority of the time, it shifts at the perfect point for me; about 85 – 90 cadence. It is very fun to ride this around. The hub is relatively light and I love not having to shift. My only concern is whether the shifting will work in cold temps. I commute to work as long as the temp is above -10 F and the winds aren’t too bad. I guess I will find out this winter. Hello out there! I wonder if this site is still active? I have a SRAM Automatix laced to a 700C wheel. I’ve had it for 8 months and love it, but just the other day I now experience a very loud grating noise (sounds like when a chain rubs the front derailleur on a road bike). I’ve never known whether it is okay to backpedal with this hub (and haven’t) but before the ride when the noise started, I ran the chain backwards in order to lube it, then came the noise, and now I wonder whether I did this myself. Any ideas or suggestions? I have to admit to being a mechanical dummy, so I will take any suggestions to the LBS (who also has no/limited hubstripping experience) and see if together we can figure it out.